We’re well on our way to the end of this story! 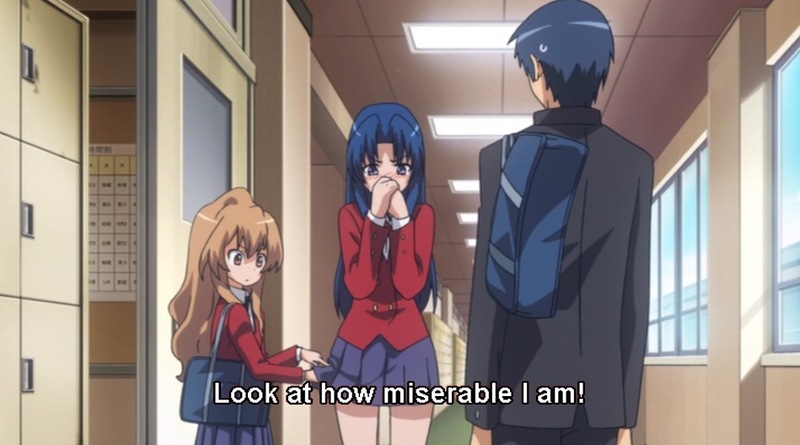 This episode kind of seems like a one-off on the surface, but it’s actually (once again) Toradora! using humor to keep us entertained/distracted while the foundations of the big character arcs in this half of the show are being set down. As I said last episode, large swathes of the second cour are lost to my memory due to late night marathoning, but I’m certain all five of our leads get significant development in the back half of the show. Which is a really cool thing. We’ve had the chance to see all five of them grow a little already, so now we get to see how the ways they’ve changed make them different now. 0:20—I was expecting “Pre-Parade” to be gone this episode, but I guess we get a few more episodes of it before we switch. Yay! 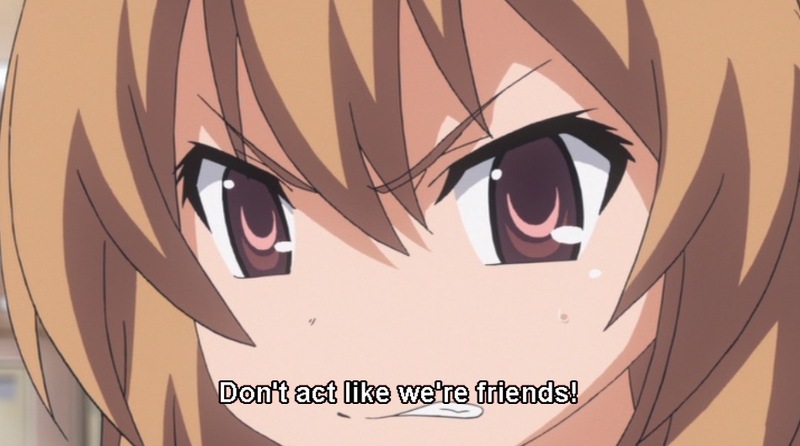 2:48—She’s already working to dissolve the rumor, while Taiga wipes snot off on her skirt. As much as they may protest it, these two are growing closer. 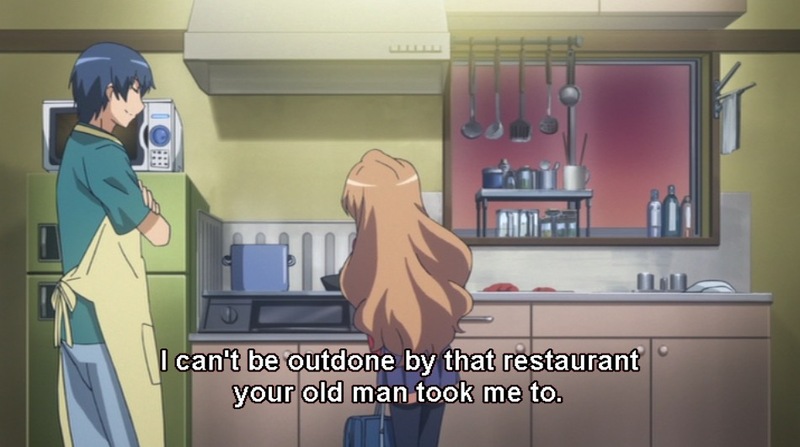 3:12—Takemiya sure does love her irony, doesn’t she? 3:34—And she loves her high schoolers and the weird things they collectively get excited about. 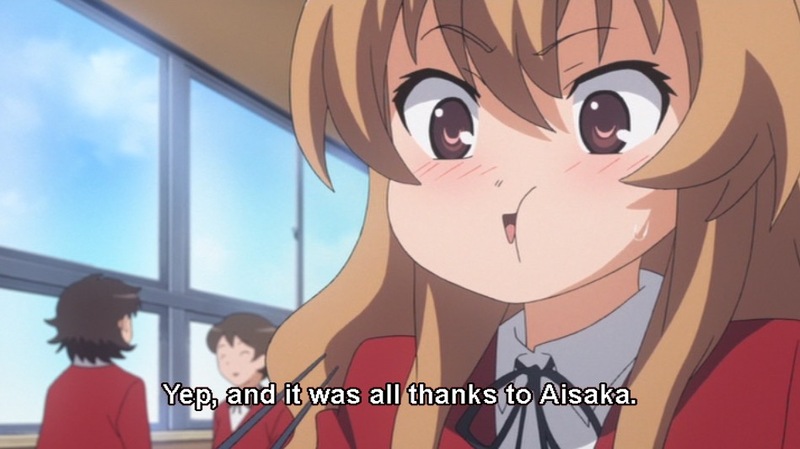 3:49—Yet, in the middle of all this, we Taiga put up a huge wall between her and the general class. 4:05—It’s especially highlighted by the way she dives into Minori. 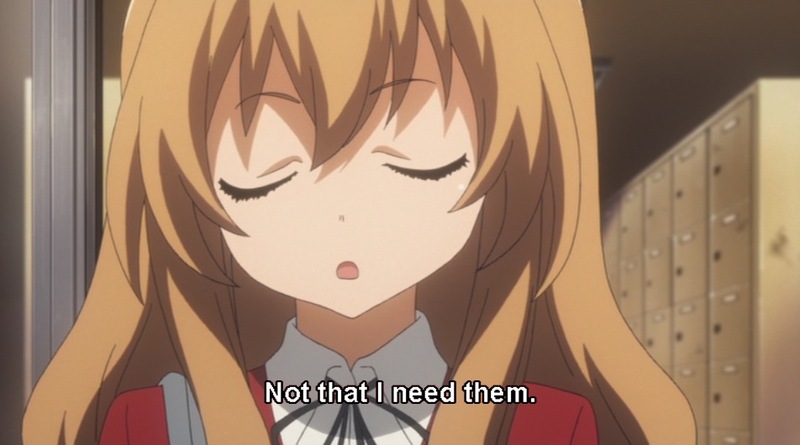 Taiga trusts very few people, and she’s not really open to trusting more. 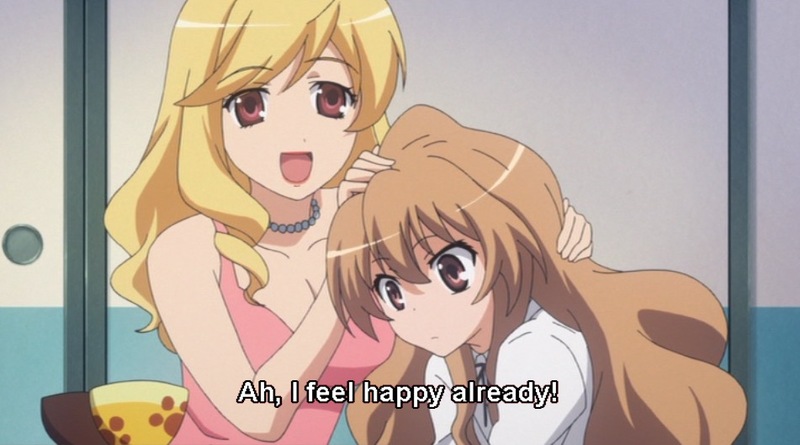 4:19—Yup, there really is something deeply messed up about the fact that the happiness rumor began on the night Taiga was most miserable. 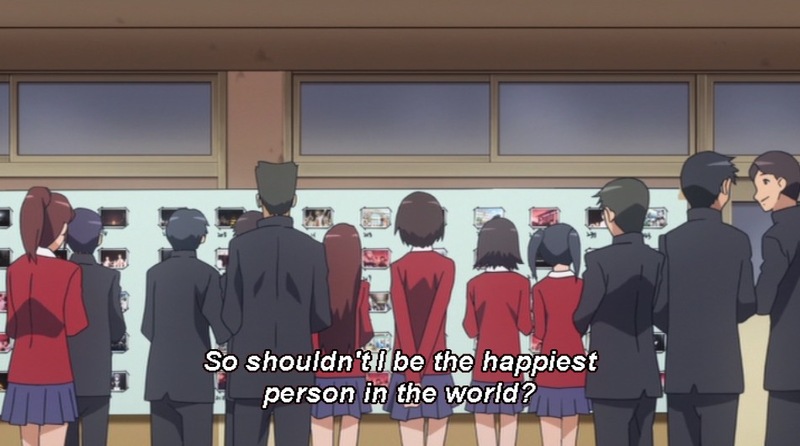 Perhaps this is Takemiya reflecting on how we can still impact people, even when we’re down in the dumps ourselves. 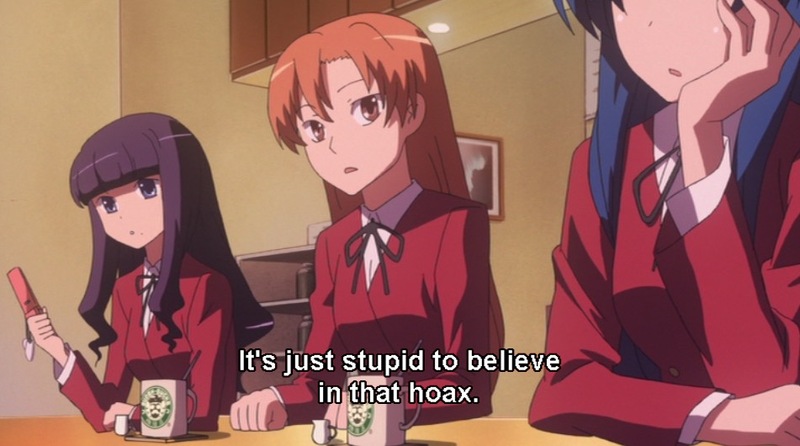 4:49—She’s gloating about the rumors about her and Kitamura, but she’s directing it specifically at Ryuuji. 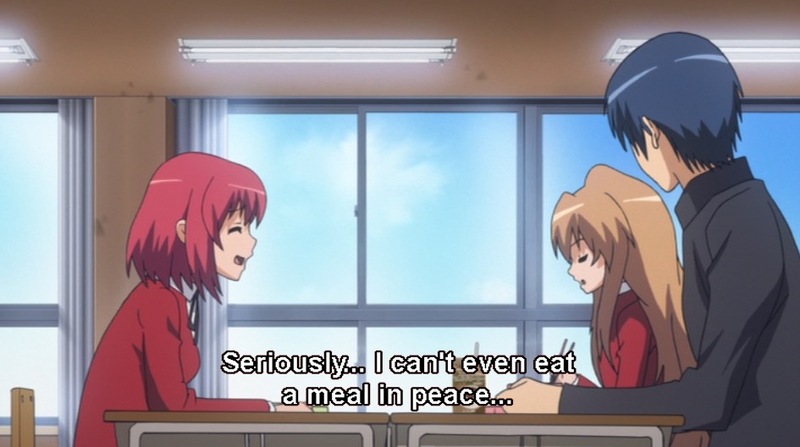 5:43—She doesn’t sit next to Minori at lunch. 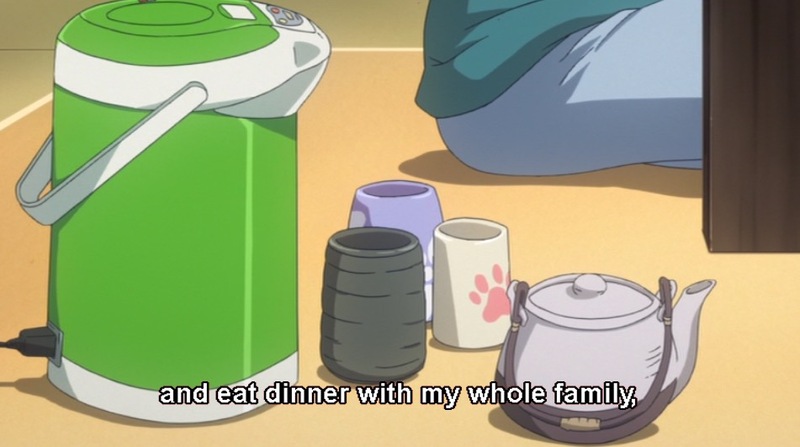 She hasn’t in all the lunches we’ve seen them eat together. 6:54—At first, this seems like kind of bad storyboarding to me because we jump out of Ryuuji’s perspective for a single shot to see Ami staring at her hand. The image comes back again at the end, but it’s still a bit jarring to suddenly be in Ami’s head, then back into Ryuuji’s. 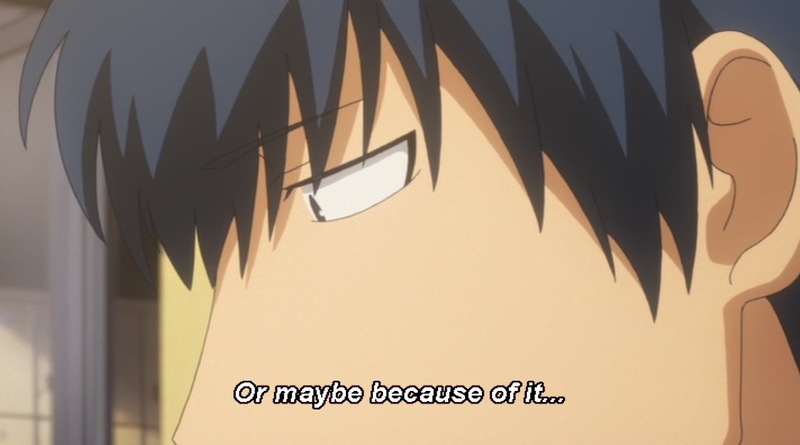 7:16—As soon as Ryuuji says he “doesn’t care” about her phone call (which is a lie), she starts teasing him. Ami wants his attention; there’s no doubt of that. 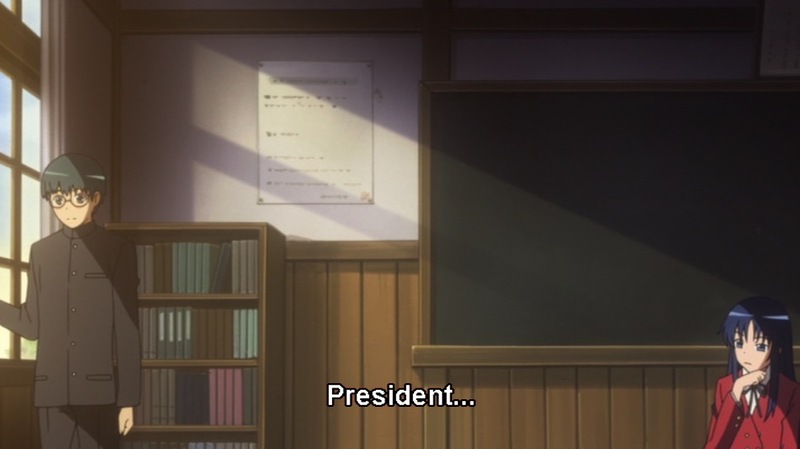 But, even here, she’s starting us on the child vs. adult theme that starts to show up everywhere this episode. 7:22—And this is super passive-aggressive, lashing out but walking away immediately after as if it’s no big deal. 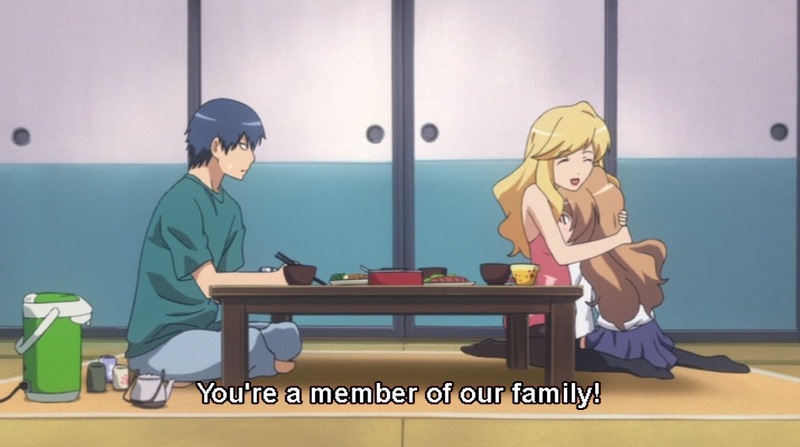 7:37—Gosh darn it, Toradora! 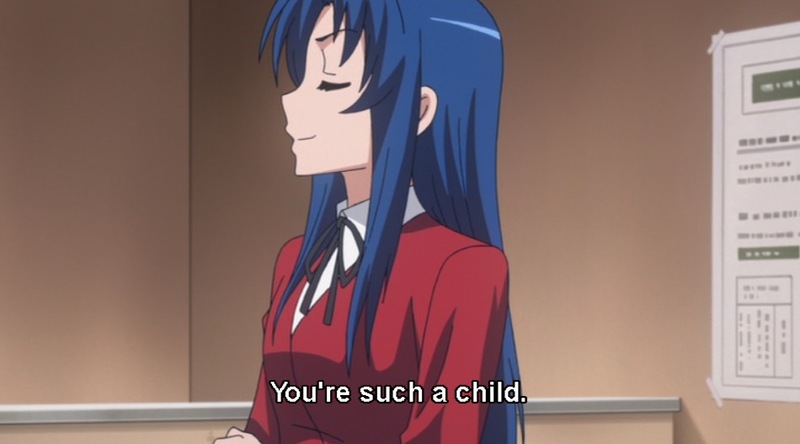 Do you have to make fun of shounen action series, too!? 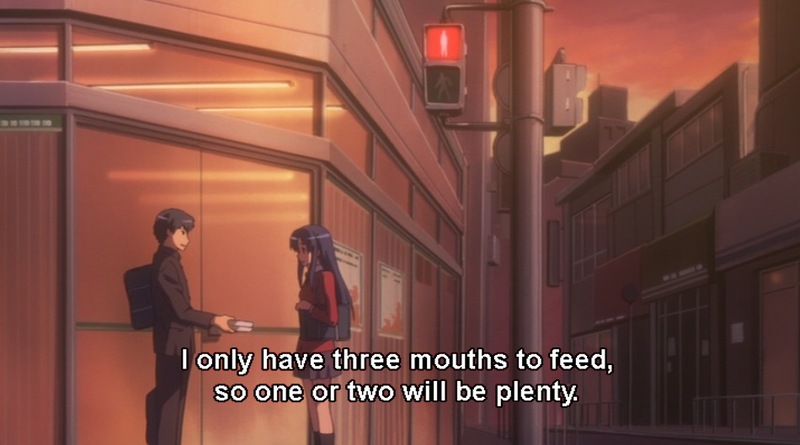 8:48—Ryuuji so well demonstrates this high school mind. 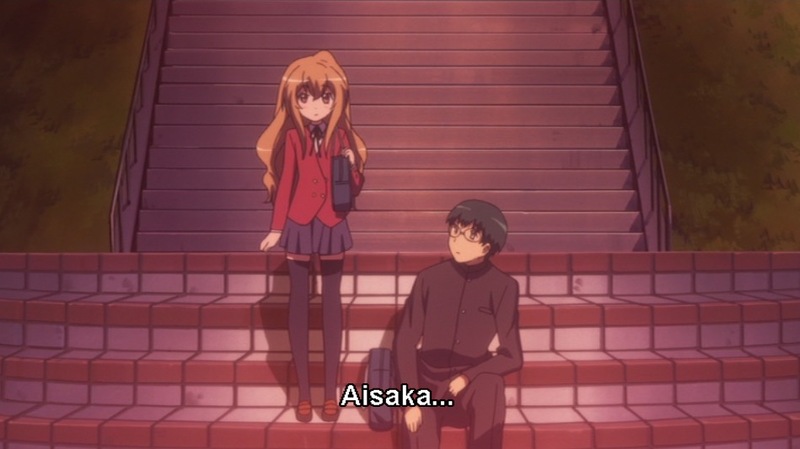 Of all people, he should know best that Taiga’s no magic charm, but he still has to wonder along with the rest of the class about her magical properties. 9:11—Is Ami integrated into their group or what? 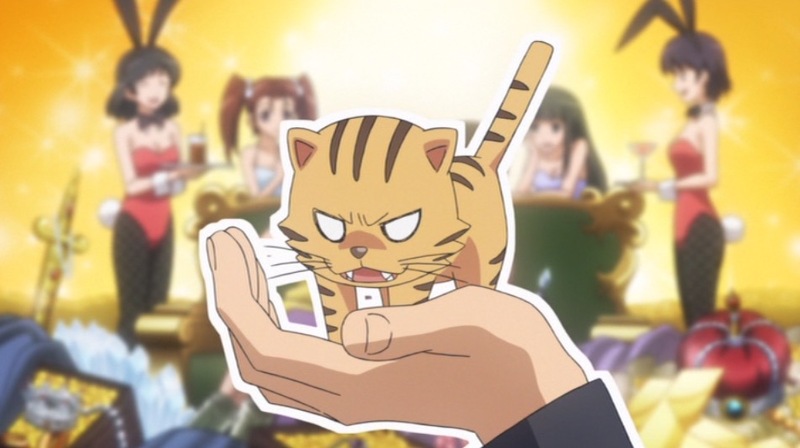 9:40—I do love that Taiga can still piss him off sometimes. 9:55—I dunno what kind of WIXOSS game Minori’s playing, but I want in. 10:36—This is a really nice way to do this. 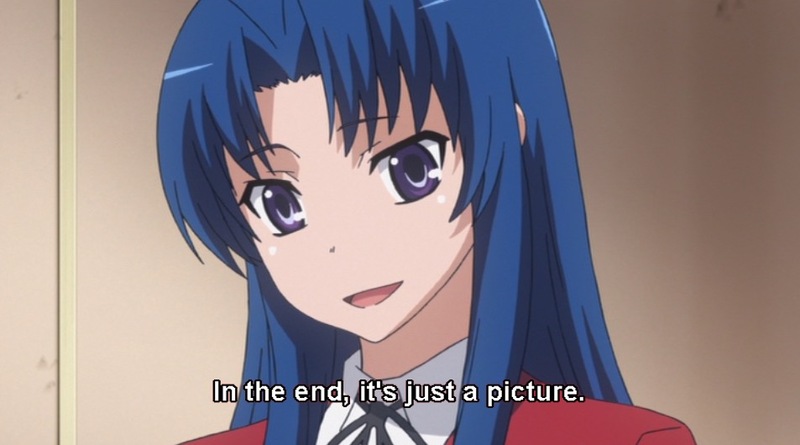 Minori looking at Ryuuji’s pictures is totally in line with her personality, and it’s nice that the picture is somewhat ambiguous in its meaning to Ryuuji due to the fact that it’s the end of the race. 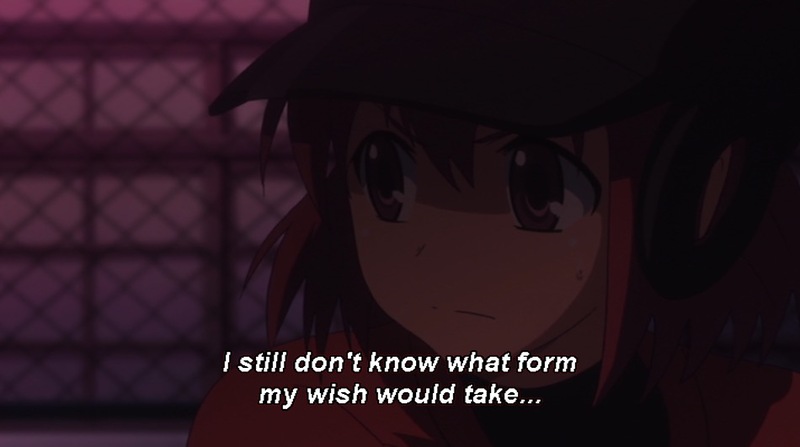 But it’s pretty clear what idea it’s put into Minori’s head. 11:15—Coming from a girl who invests so much into outward appearances…she would know best. But we know how fake that side of her is, so this could just as easily be the opposite of what she actually thinks. 11:30—Cool to see Ami taken aback at Minori’s rapid switch between reflective and hyper-genki. She does the exact same thing all the time, but when faced with it from someone else, she doesn’t know how to react. 12:27—Oh ho, someone thinks she’s above the high school games. But why is she so eager to grow up? Is it because she’s frustrated by all the play-acting she see going on around her, the very fakery she’s embraced for so long? 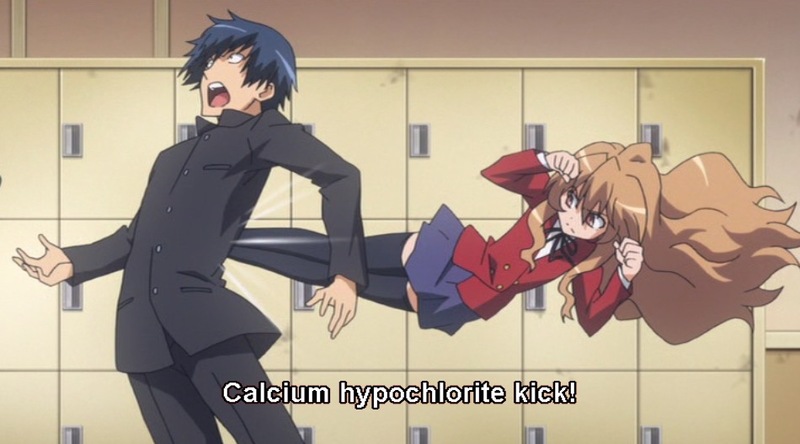 13:07—And Taiga acting like a grown up here, while being very much a kid. 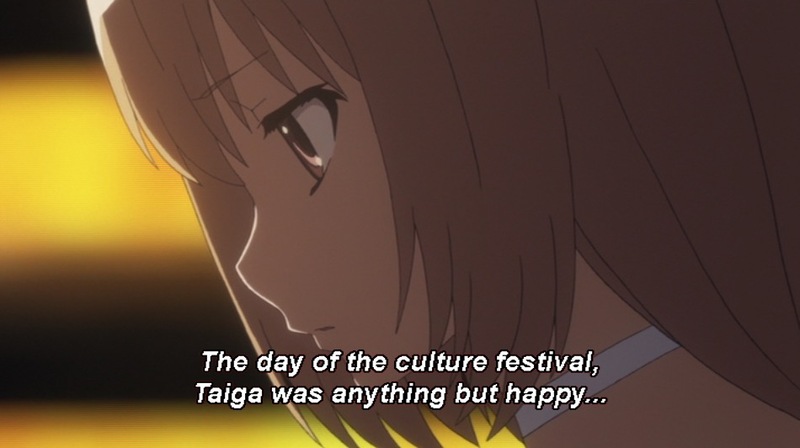 13:42—”Even after everything that happened…or maybe because of it…” As you should know, I’m of the latter opinion, that the events of the festival have pushed Taiga back to her old self because she desires not to see anyone else get hurt. 14:23—Because it’s easy. You guys remember the ghosts/UFOs motif? The one that represented love and the whole conglomeration of related ideas? It’s a motif based on a fantasy, on the desire to see a superstition fulfilled. 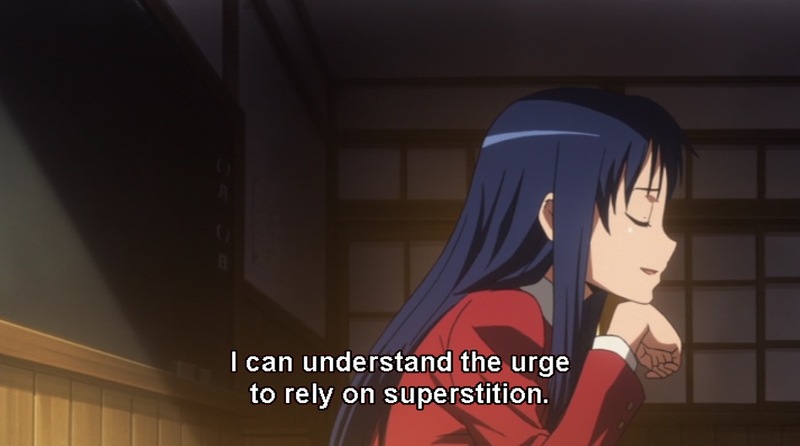 And superstitions are things we know are fake, but adhere to anyways. It is, in a sense, hoping against hope. 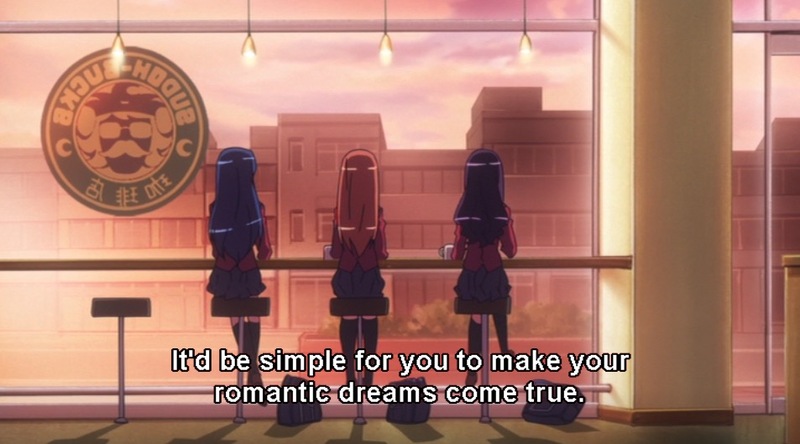 So when Minori says she’s never fallen in love with anyone, she’s also saying that she doesn’t really believe she ever will. 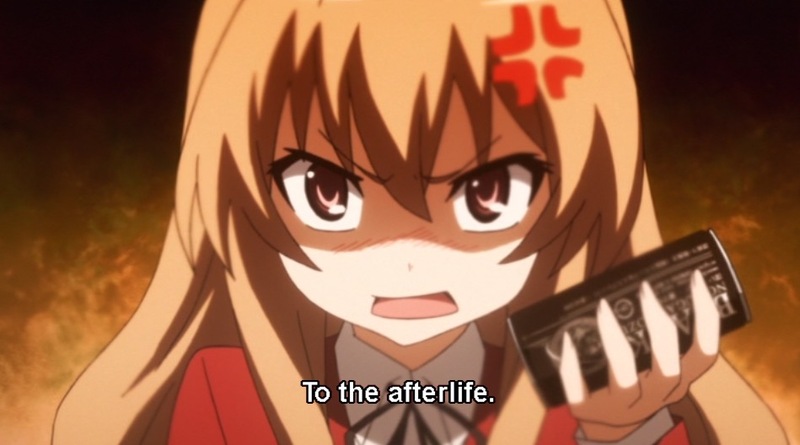 When Taiga looks away from the “UFO,” it’s because she’s refused to accept superstition and fantasy, something she demonstrates violently time and time again this episode. 14:37—A lovely shot, and that is one heck of a visual divide between them. The shadow in the top half of the screen limits their shared space, and yet they’re still at the very edges of the shot from each other. There’s a personal divide here that matches the emptiness of their visual divide. 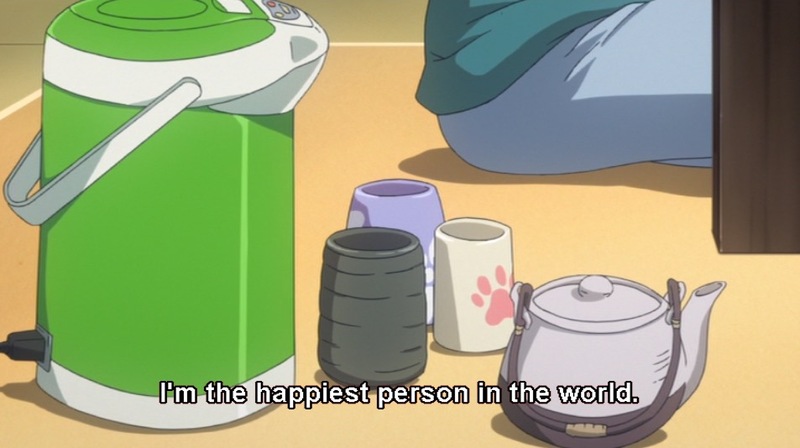 15:05—For everything she does, Ami wants reality. She wants to be done with the games, with the superstitions. And yet, this is in constant tension and contradiction with her own impulses to hide her true self. 15:14—The fact that they base this idea on her outward appearance demonstrates exactly why she wants out. “You can have anyone you want,” they say. But she knows she can’t. 16:06—You can’t really see it as well in the previous shots of their faces, but Ami is stand very, very close to him. 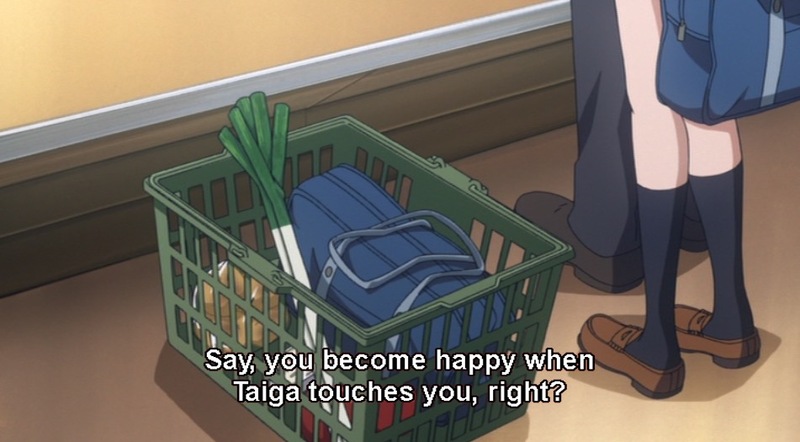 The shopping basket with the food Ryuuji is buying for Taiga crowds in on them. 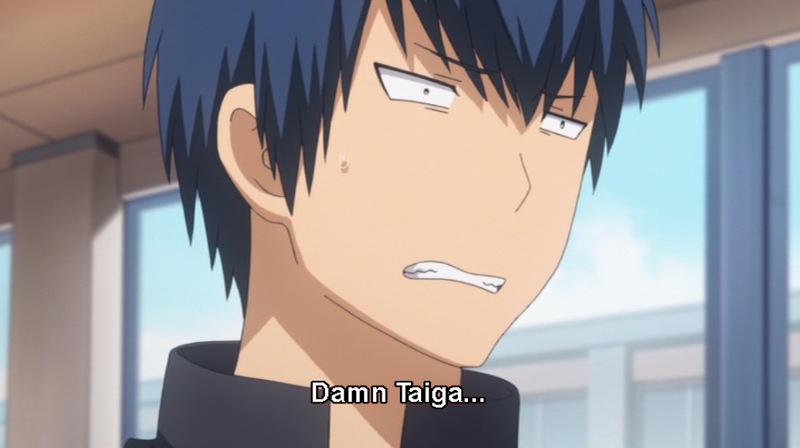 16:29—Ryuuji’s not the only one who understands Taiga. 16:55—A very cool shot with a ton of empty space on the right side of the frame. 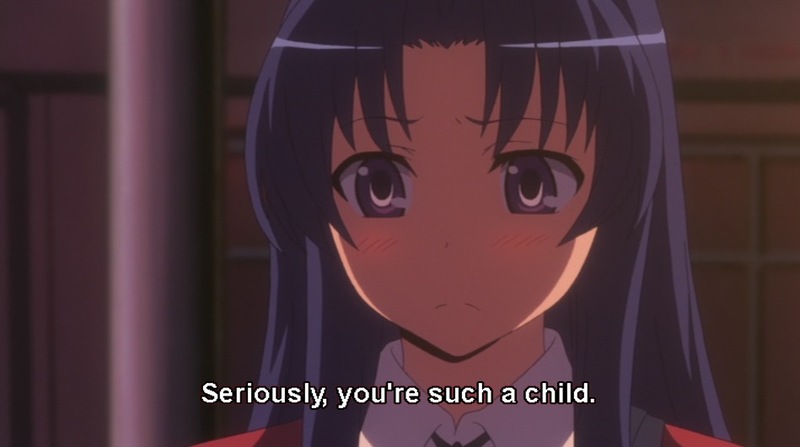 17:15—You can barely even see Ami’s blush in this lighting, making it believable that Ryuuji also wouldn’t notice. Why’s she blushing? Because of the particularity of his kindness. He remembered her phone conversation, noticed how it affected her, brought it back up. Because he’s paying attention to the real her and refuses to engage with her when she’s being fake with him. 17:29—He returns the jab she made at him earlier. 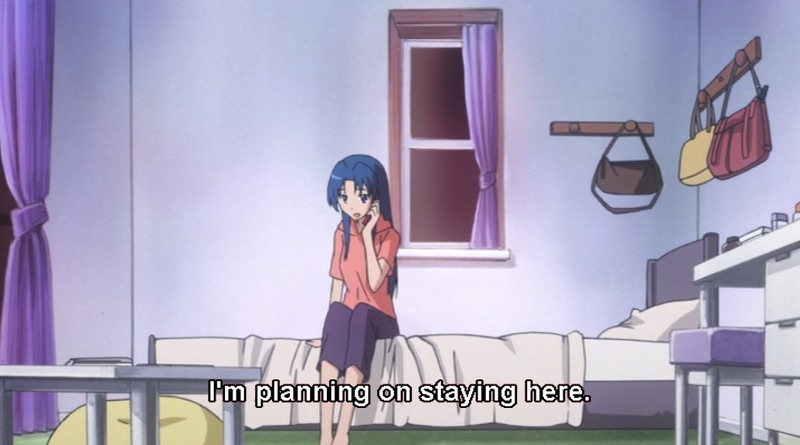 Maybe Ami’s trying to be an adult, but she’s got just as much room to grow as everyone else. 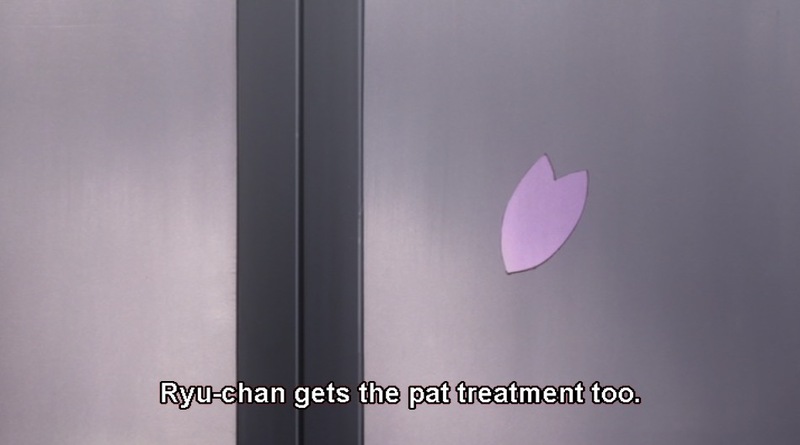 18:08—I believe this is really only Taiga’s second approach, the first being when she confessed to Kitamura. She’s startlingly calm. 18:36—She doesn’t freak out when he touches her. Instead, she asks. How is it that the girl who is often the most immature of the group can be so far ahead of them in some things? 18:58—Another shot with empty space on the right side of the frame and, just like in 16:55, the empty space is a road leading away from where the characters are talking. If that’s not a symbol for impending change in relationships, I don’t know what is. 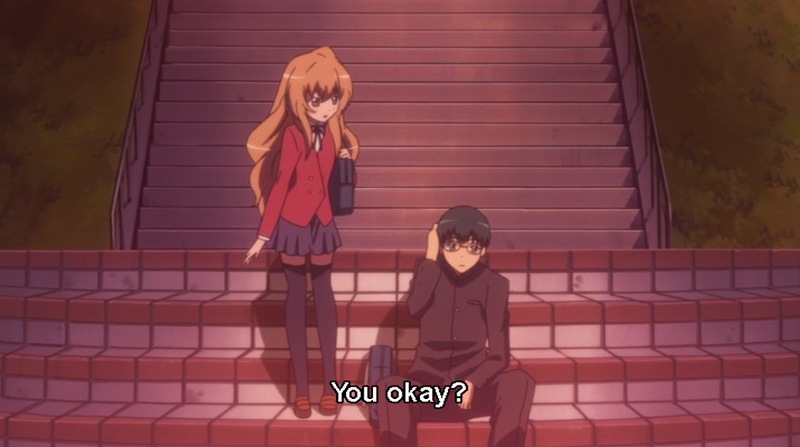 20:22—But Taiga’s protecting him. 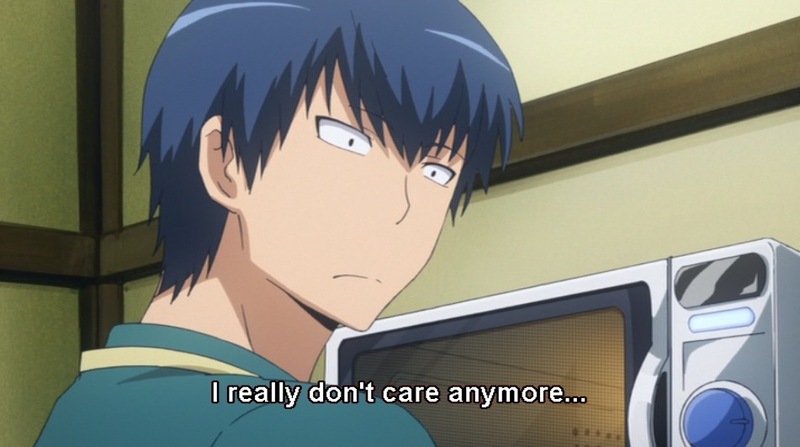 “I don’t care anymore…” she says. So you don’t have to worry about me. 20:52/20:55/20:59—Another stellar moment of parenting by Yasuko. As she tells her kids what’s most important to her, she’s telling them what they should value, too. 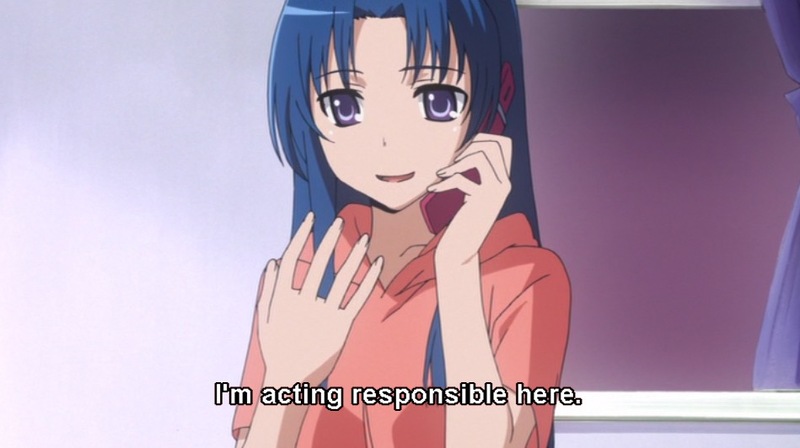 21:25—Action shows character, and Ami’s action is to stay here, where she’s starting to be happy. 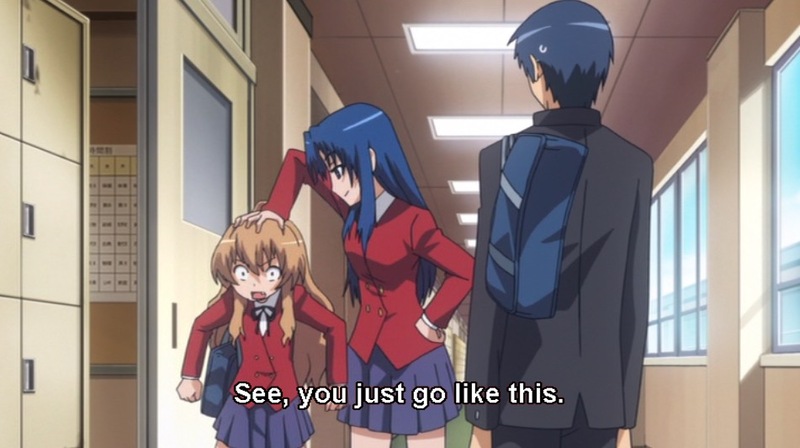 21:36—She’s back to staring at the hand she touched Taiga with. 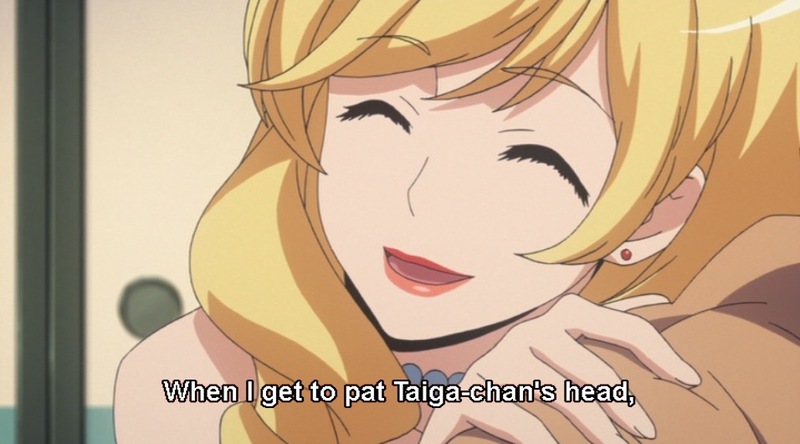 Taiga, the person who has really been the key to Ami’s integration as a friend. 21:56—It’s no coincidence that Minori shows up in the middle of Ami’s monologue about being unsure of her own wishes. 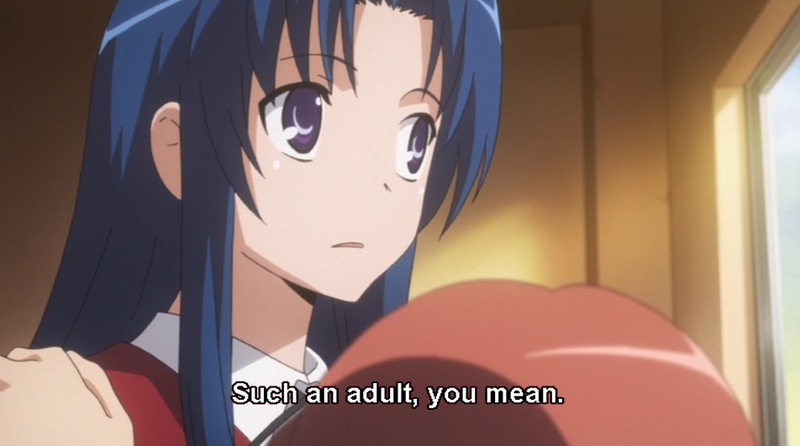 Of all the characters in this show, Minori and Ami are most alike. 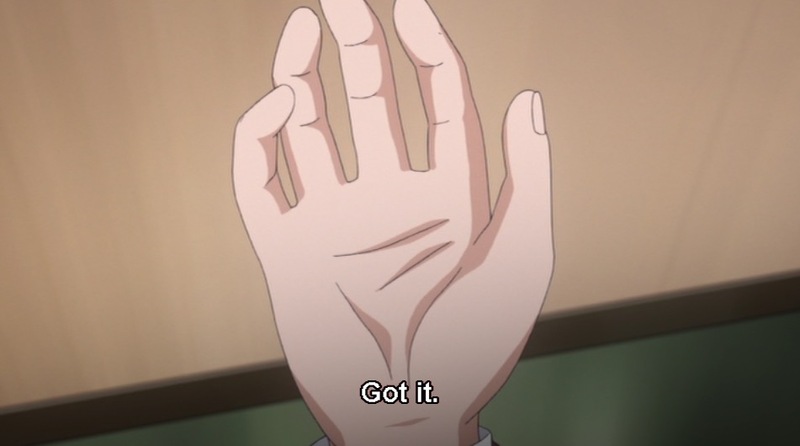 We’ve seen this technique before during the vacation arc, but it’s just so cool to see visual direction using information about one character to imply our understandings of other characters. 22:11—Hey, it’s been a while! Phew, this episode was really needed. You have to let there be ebbs and flows in your drama or the audience will just get worn out. 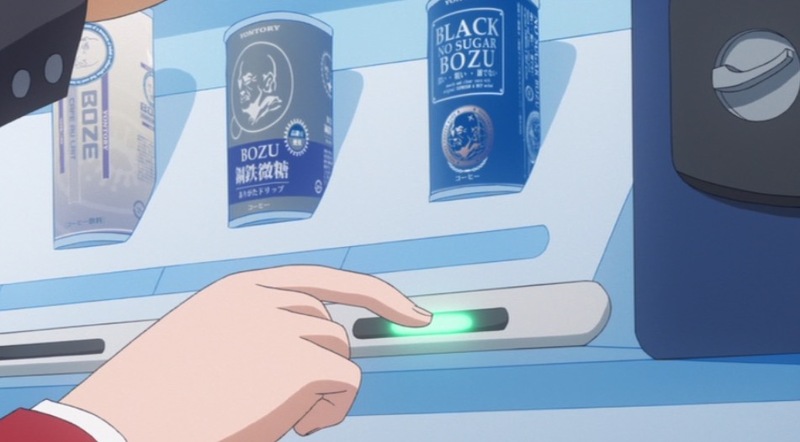 We got lighter moments in the middle of the culture festival arc that kept the arc from getting too heavy, and in the overall structure of the show, it’s really smart to have this more humor-focused episode to give us a break from the intensity of the emotional waves of the last arc before we dive into more drama. And I’m finally caught up! 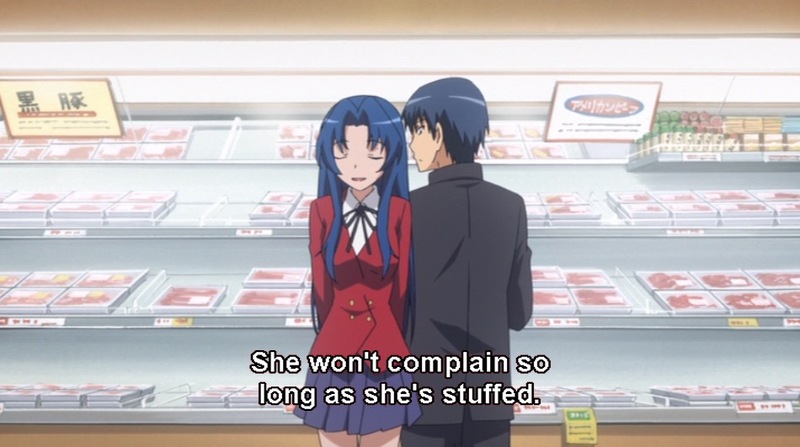 This is another example of Toradora’s stellar writing (and another excellent review by you). 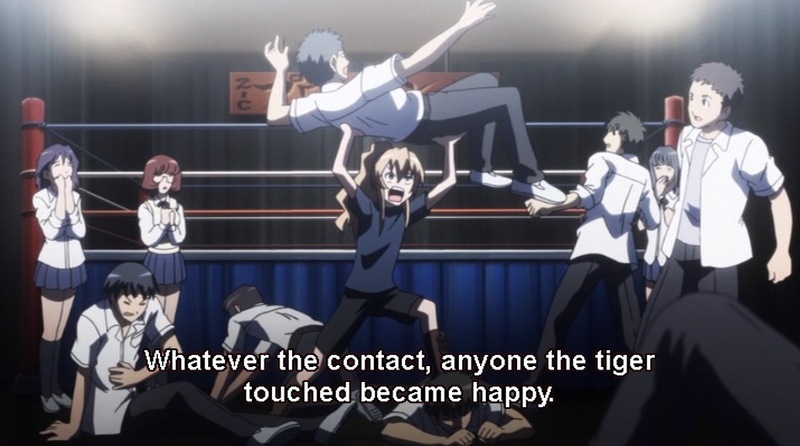 It’s actually mostly a filler episode, expanding off a cute little short story where the freshman boy who kept trying to touch Taiga in this episode was the main character and our leads make only a few appearances. But the way it’s reworked for the anime, it flows seamlessly into the overall narrative and works great as a “reset and refocus” episode ahead of the second half. 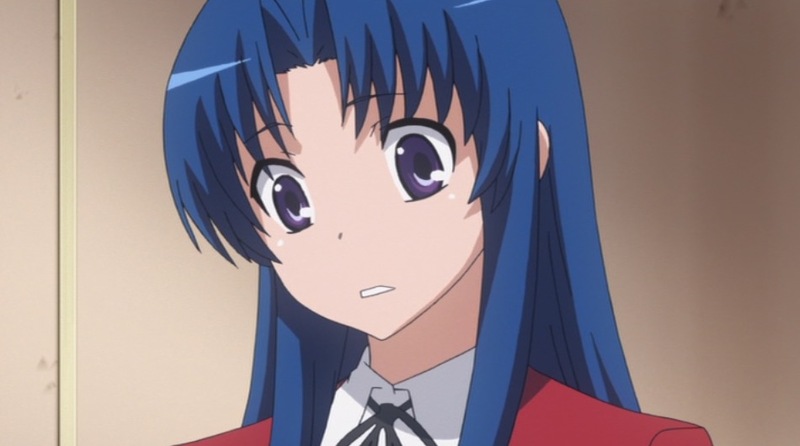 I think Ami appreciates the way Ryuuji is able to pierce her armor here. Everyone else keeps praising her maturity and adult-ness, but while she can act the part, she’s not an adult yet. She’s 17, same as the rest of them, and for all of her life experience she’s still just as unsure of herself, her wishes, and her place in the world as everyone else in their class. 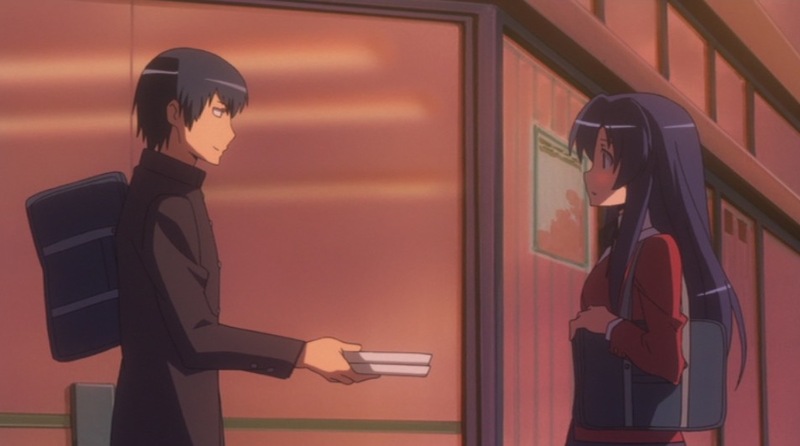 Ryuuji’s the only one in this episode who seems to get that, but he also adds a gesture of friendship and support here that shows her it’s okay, he still accepts her anyway. It’s no coincidence that after she talks to him is when she makes her final decision to stick around. 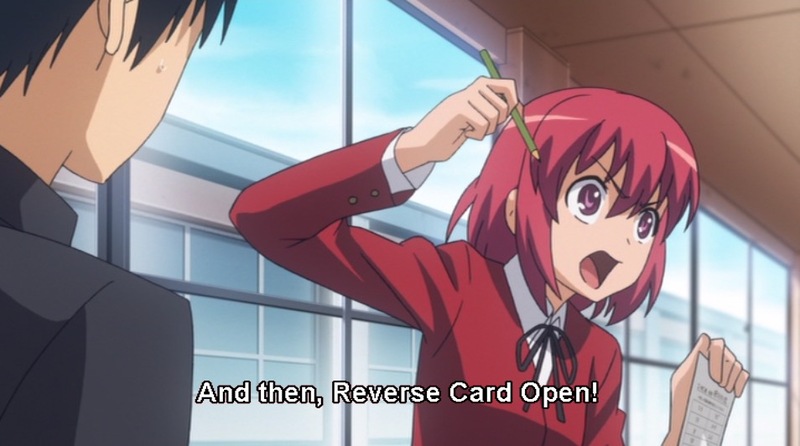 Pretty sure when Minori is doing the pictures-as-card-games thing that she’s making references to Yu-Gi-Oh. Dang, this was only a short story in the original material that was expanded for the anime? Big kudos to Okada here, because she did a fantastic job laying the foundations for the rest of the series, as I expressed in the post. 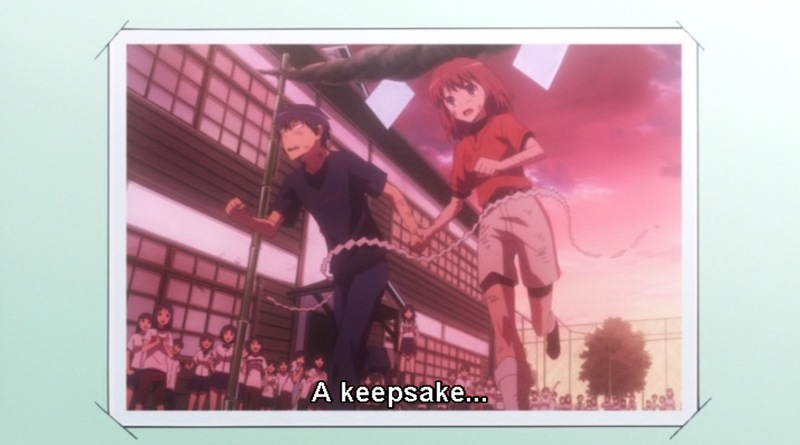 Ryuuji is pretty impressively steadfast in not allowing Ami to draw him into her games. Whenever she slips into fakery, he just ignores her, silently demanding that she be real with him. It’s pretty cool stuff. & it may be Yu-Gi–Oh, but WIXOSS is much more relevant these days!